The fact that you have found this page tells me that you are finding it hard to gain the confidence you need to perform magic as well as you would like. You are not alone. It’s the most common challenge all magicians must overcome. The good news is that there are a few simple techniques you can apply RIGHT NOW, that will dramatically help you. I know.. Because they helped me too. 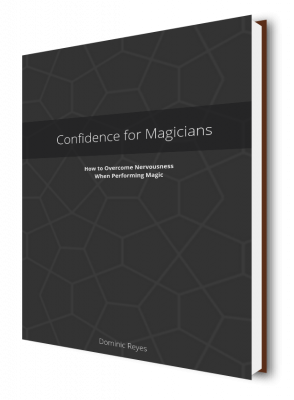 In this free book, Dominic Reyes will show you how to overcome nervousness and develop confidence as a magician. The book is full of techniques and tips used by performers worldwide to improve their ability to perform for the public. Why so many magicians suffer from nervousness. The reason you go to pieces when you perform even a well practiced trick. How to remove feelings of stage fright and panic. The REAL SECRET to confidence as a magician. In Confidence for Magicians you will find advice on how to overcome nervousness. It’s all good stuff and WORKS, But you will discover the REAL SECRET at the end of the book..